"2D's company, 3D's a crowd" - Make a 3D game using only 2D graphics. Limited Vocabulary - Limit your player's verbs (run, jump, punch) to just one! Make a game that explores that verb to its fullest. "You Just Played Yourself 🔑" - Make a game where you play against yourself, or a game where your past movements or actions are important in some way. Hoisted - The game conspires to destroy the player in some way; or the game allows the player to be the cause of their own undoing. Texture Thrift - Use the same art/prop asset as many times as possible in your game, whilst obscuring the fact you are doing this. Frug Froctions - Include another, entirely separate game inside your game. 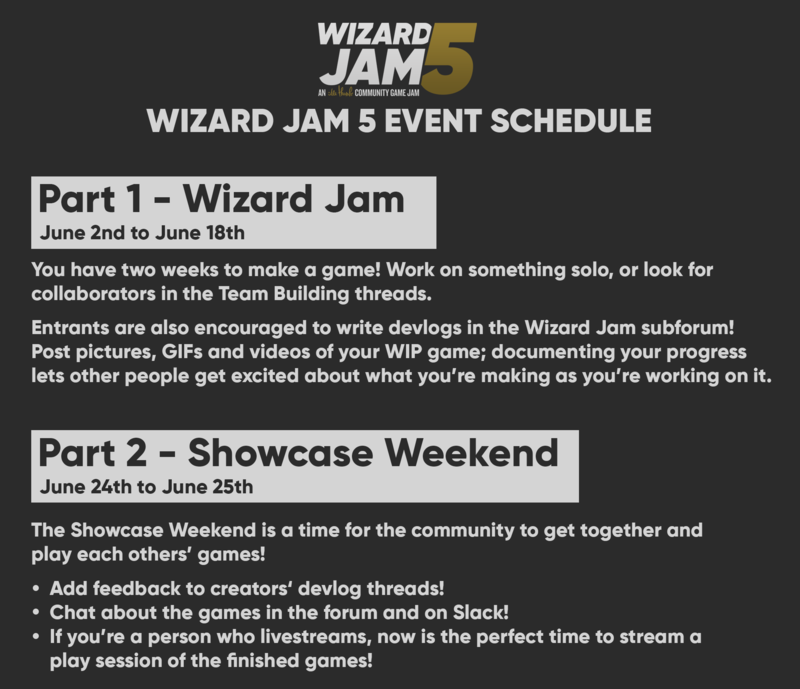 For Wizard Jam 5, we're trying something new! After the jam finishes, we'll be hosting a Showcase Weekend; an opportunity for everybody to step back from the game making process and look at what everyone else has made; with an emphasis on giving feedback and comments to fellow creators. It's covered in the schedule below, and there'll be more details to follow.